Preface. Simulation studies of driver performance. (Contributors: J.A. Wachtel, O.M.J. Carsten, S. Gallimore, L. Harms, I.C. Bichao, D. Yager, A. Lewis, G. Matthews, T.J. Sparkes, A.H. Clarke, M.C. Clarke, H. Scherer). Visual processing and collision avoidance. (Contributors: D.L. Stewart, J.R. Lishman, C.J. Cudworth, F. Saad, C. Berthelon, D. Mestre, R. Taramino, W.W. Wierwille, L. Tijerina, P. Cairney, J. Catchpole). Cognitive aspects of visual information processing. (Contributors: M. Wierda, M.P. Bruyas, B. Le Breton, A. Pauzie, L.L. Avant, A.A. Thieman, A.L. Zang, S.–Y Hsu, J. Theeuwes, M.A. Recarte, L.M. Nunes, J. Lillo, G.J. Hole, L. Tyrell, M. Land, J. Horewood). Visual requirements of in–vehicle guidance systems. (Contributors: A. Pauzié, S. Anadon, J. Reeves, A. Stevens, L. Stapleton, N.J. Ward, A.M. Parkes, G. Labiale, A.W. MacRae, S. Milligan, W, Gottlieb, S. Scherbarth, K. Guse, P. Péruch, J–L. Vercher, G.–M. Gauthier). Driver support systems. (Contributors: P. Padmos, J. van Erp, J. Schumann, J. Löwenau, K. Naab, M.J. Kuiken, J.A. Groeger, M. Halliday, J.A. Baird, H.J. Dudfield.). Visual performance in degraded visibility. (Contributors: L. Nilsson, H. Alm, N.J. Ward, L. Stapleton, A.M. Parkes, M. Fowkes, H.S. Storey, Y. Guillard, G. Loos, M. Colomb, V. Carta).Dealing with drivers' visual impairment. (Contributors: J.M. Wood, R.J. Troutbeck, T. McGarry, S.W. Mackie, T. Barrie, E. McClure, G. Walsh, B. Rassow, W. Poplar, G. Mouat, M. Dunne, J.W.A.M. Alferdinck). Visibility restrictions and vehicle control. (Contributors: F. Hella, J.F. Schouller, M. Tisserand, M.G. Boocock, A.K. Weyman, T.C. Corlett, J. Naylor, H.M. Kahlid, P.C. Ooi, D. Giguère, C. Larue). Arousal and visual performance (Contributors: N. Galley, G. Andrès, L. Nunes, M. Peralbo, A. Risso, P. Vieiro). Author index. Subject index. 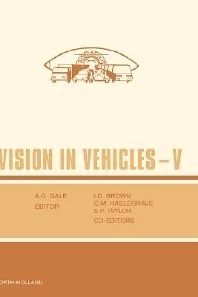 This book is based on the proceedings of the Fifth International Conference on Vision in Vehicles. The aim of the conference series is to enable international researchers from different disciplines to meet and exchange ideas on the current state-of-the-art of all aspects related to vehicles and vehicle controllers. This is perceived as encompassing the internal and external design of a vehicle, the environment in which vehicles move, as well as the visual, perceptual and cognitive limitations of the vehicle controller. All types of vehicles (including underground mining vehicles, helicopters, trains and motorcycles) are considered, though the majority of papers deal with automobiles and their drivers. The conference keynote address Automated Highways: A Vision of the Future, which was presented by John Bloomfield, set the tone for the meeting. The proceedings, as contained in this volume, begin in a similar vein with chapters considering Simulation Studies of Driver Performance, followed by a section on Visual Processing and Collision Avoidance. Cognitive issues are addressed in several chapters detailing recent work on Cognitive Aspects of Visual Information Processing. The growing use of information technology is covered in two subsequent sections concerning firstly, the Visual Requirements of In-Vehicle Guidance Systems and secondly, Driver Support Systems. Environmental factors are discussed in a separate section, as is driver's own visual impairment. The final section concerns Arousal and Performance and discusses alcohol effects on driving ability. Vision in Vehicles V, with contributions by experts from a diverse range of disciplines, including optometrists, psychologists, physiologists, human factors specialists and engineers, will undoubtedly stimulate the progression of research in this area.